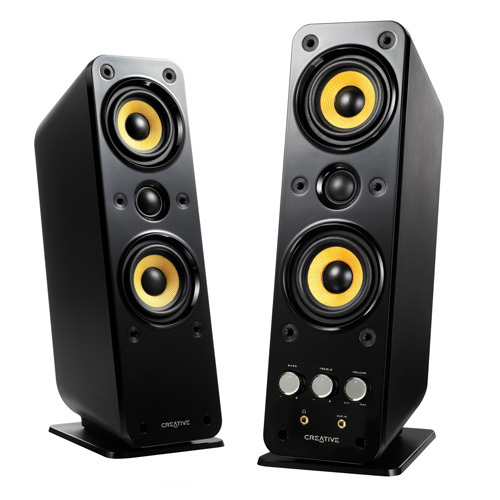 Fill your room with vibrant audio from the GigaWorks T40 Series II speakers, the enhanced model of the award-winning GigaWorksT40.The GigaWorks T40 Series II propels audio enjoyment into the next level of acoustic fidelity. There's no need for a physical subwoofer as the three-driver Midrange-Tweeter-Midrange (MTM) audiophile configuration comes with BasXPort technology - delivering excellent dynamics with rich extended bass. While the silk dome tweeter with dual woven glass fiber drivers produces crystal clear highs with full range audio, the whole system also offers an improved power output of 16W RMS per satellite.With a refreshing design and style, the GigaWorks T40 Series II is set to be a perfect addition to any living room or desktop.